"[...] natural and intimate performances, [...]Gallagher playing Merryn with a deep sadness that’s not immediately apparent." "They are outstanding — separately and together — wholly natural and credible at every moment." "She’s silly, she’s funny, but most importantly…she’s good. The same energy she uses to give you the giggles is the same alluring energy she uses to get to the root of a character and bring out the most emphatic portions of the roles she plays. She has an ability to disarm you and connect with you easily when you meet her, and that ability comes in handy as a performer." "Cygnet’s well-cast time-traveling play is mesmerizing." 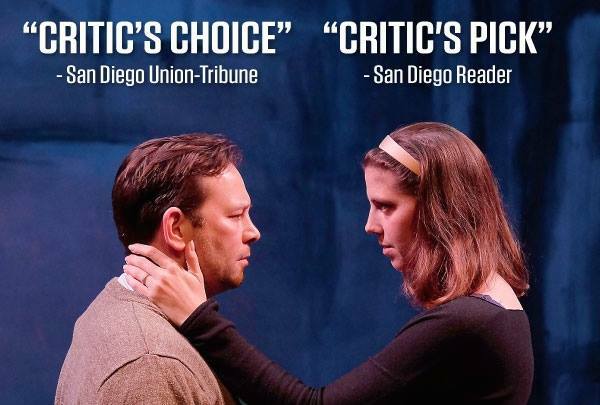 "The well-produced play is thought-provoking and heart-tugging, and will no doubt rank among San Diego’s best shows of 2016." "It’s a mesmerizing theatrical tour de force." "Beth Gallagher, impressive as the [...] younger Elizabeth Law"
"Cygnet’s production is stellar [...] the cast alternates from fluid movements to stillness in ways that verge on the hypnotic." KSDS/PAT LAUNER, CENTER STAGE: "When The Rain Stops Falling, Cygnet Theatre"
"The Cygnet Theatre production is outstanding"
"The ensemble is magnificent, each marvelous performer giving heft and depth to an intriguing character and an impressive array of emotions." ​"The beauty of “Car Plays” is its intimacy (which may be too close for comfort for some) and its crackerjack timing (it mostly moves with the precision of a Swiss watch). With the change in thematic style this year, “Car Plays” has come back fresher than ever, and as always, it’s such an audience favorite that it’s mostly sold out."